Susan played the inquisitive Nancy Spizer in Boiler Room. She is a graduate of NYU's Experimental Theatre Wing. Off-Broadway productions include: Scoons in Sam Shepard's Angel City, Caddy in Faulkner's The Sound And The Fury, and Hamlet in Hamlet. LA productions include: Monica in Aram Saroyan's Landslide, and Marianne Faithful in Under My Thumb. 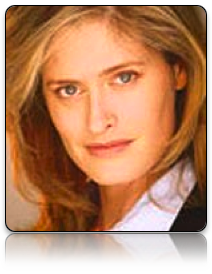 Film/TV work includes: Silk Stalkings (USA), Stolen Hearts (HBO), Anybody Home? (Steadyworks), and Days Of Our Lives (NBC). Commerically she can be seen as the lovely Soviet broad for Twix Ice Cream Bars. Susan also starred in The Window (Aberfoyle Pictures) which recently played at the Hollywood Film Festival and the New York International Film Festival.